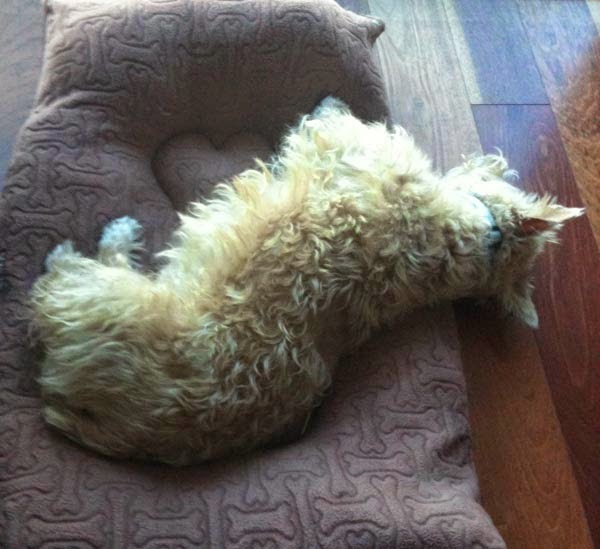 It's Wordless Wednesday...you know what that means: time to caption another silly Scottie photo! What do you suppose Mr. K is thinking/doing in this action shot? Trying to walk like a human? Surrendering to the Scottie Police for stealing from the treat bin? Your guess is as good as mine. Happy Wordless Wednesday, friends! For generations, moms everywhere have said that breakfast is the most important meal of the day. That's why Scottie Grandmadre and I got up early and set to work on a special breakfast treat for Heather and Mr. K after their morning walk. 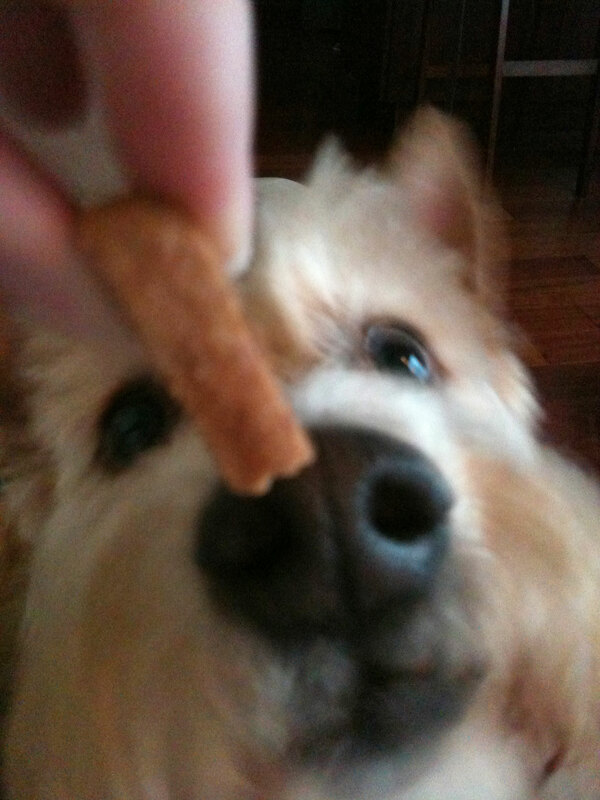 We gave them their usual Blue Basics - Salmon and Potato dry food so they wouldn't go hungry while we finished cooking up their special treat and just under an hour later, they feasted their eyes (and their snouts!) 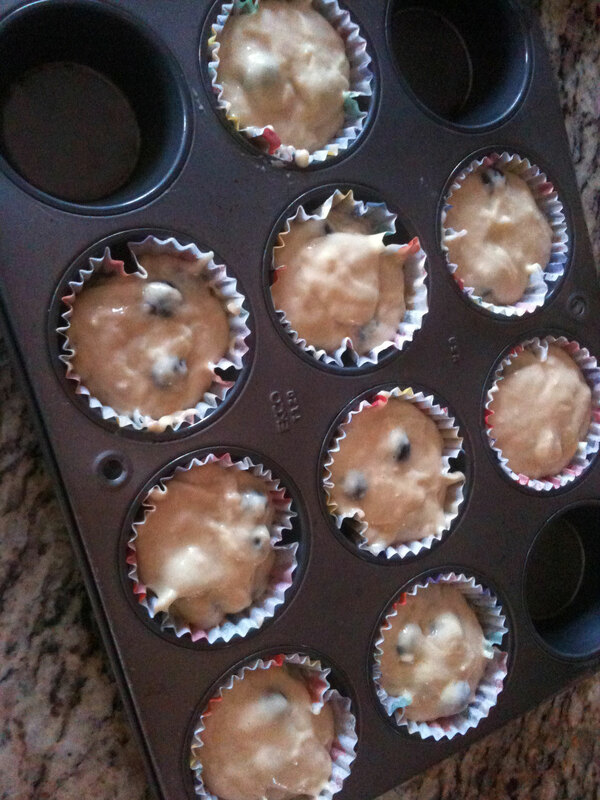 on some yummy doggie blueberry muffins! I found the recipe in The Good Treats Cookbook for Dogs written by Barbara Burg, the owner of Canine Cafe Charlotte. 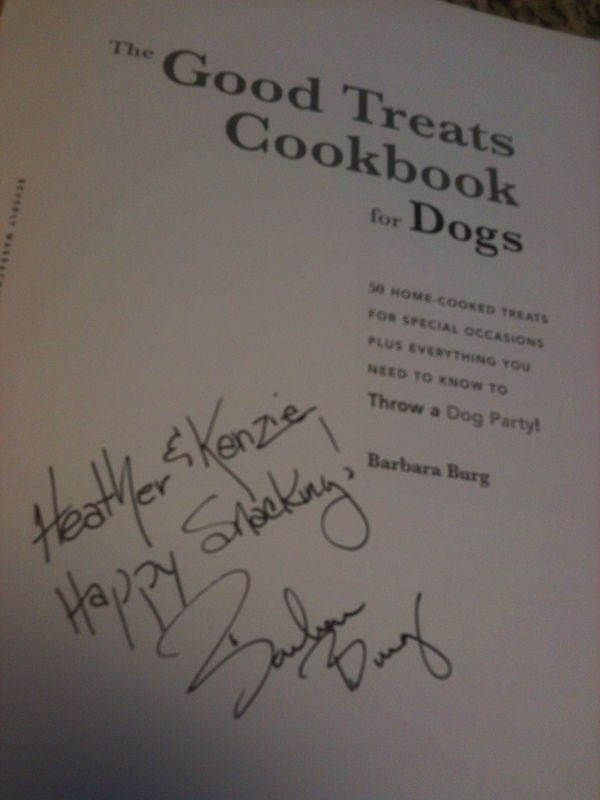 I met Barbara when I picked up Heather and Mr. K's birthday cakes back in October. I was absolutely enchanted (as were Heather and Mr. K) by her assortment of treats and, knowing I wouldn't be able to make frequent visits to the store since we live out of town, I bought a copy of her book so Heather and Mr. K could relive their Canine Cafe Charlotte experience again and again. Of course, being the busy Scottie Mom I am, it took me a while to produce some of the yummy goods but I think Heather and Mr. K would agree it was well worth the wait! To see more of Barbara's treats Heather, Mr. K and their birthday pawty guests enjoyed back in October, click here. 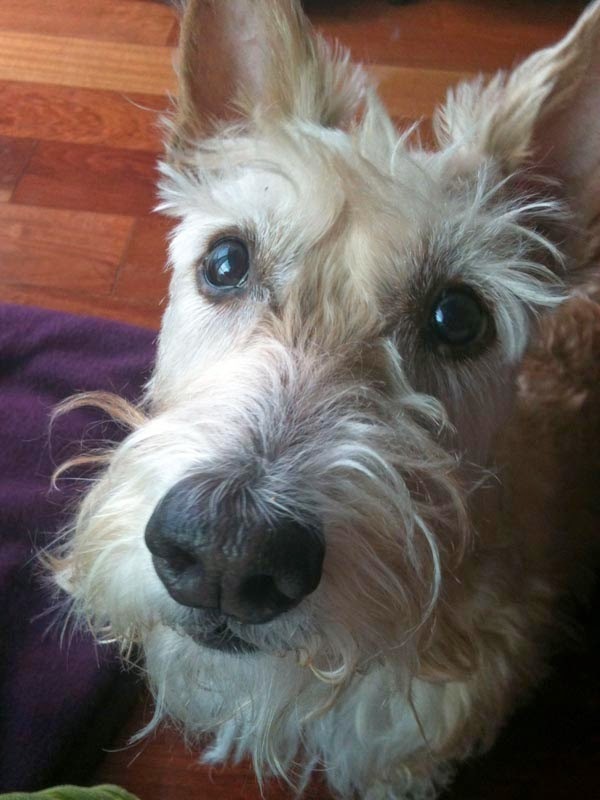 A few months ago, over the Thanksgiving holiday weekend, Mr. K suffered a broken dew claw courtesy of his Scottie Mom's foot. Not a yelp or even a peep came out of his mouth. Instead, he ran up the stairs ahead of me in pursuit of one of the evil C-A-T-S that reside at his Scottie Grandmadre's house. Now, his precious paw is all healed and he may have forgotten the instance all together, but I haven't. In fact, I was recently reminded of it when I accompanied a friend of mine out for a night out on the town. There we were, standing in a bar talking to people when I felt a stab of a stiletto heel on my middle toe. And, as she shuffled, another stab on the two toes next to that one. I, unlike Mr. K, was not the kind to suffer in silence. I shrieked as the pain shot through my foot and the blood started flowing. And once my foot was released from under my friend's, I even lost my own footing for a short time. It is in times like this that I wish we were as resilient as our Scottie companions. Aside from licking his paw every once in a while after I stepped on his paw back in November, Mr. K showed no sign of injury or discomfort. He was perfectly content to continue playing and getting into his usual mischief. My injury had me hobbling around without shoes, wincing for a good day or two and though the pain was signifcant, I wasn't about to tend to my wounds by licking them like Mr. K does when he's hurt! Alas, in a few days, everything went away but not before a stern lesson was learned: What goes around, comes back around...and twice, if not three times, as hard! 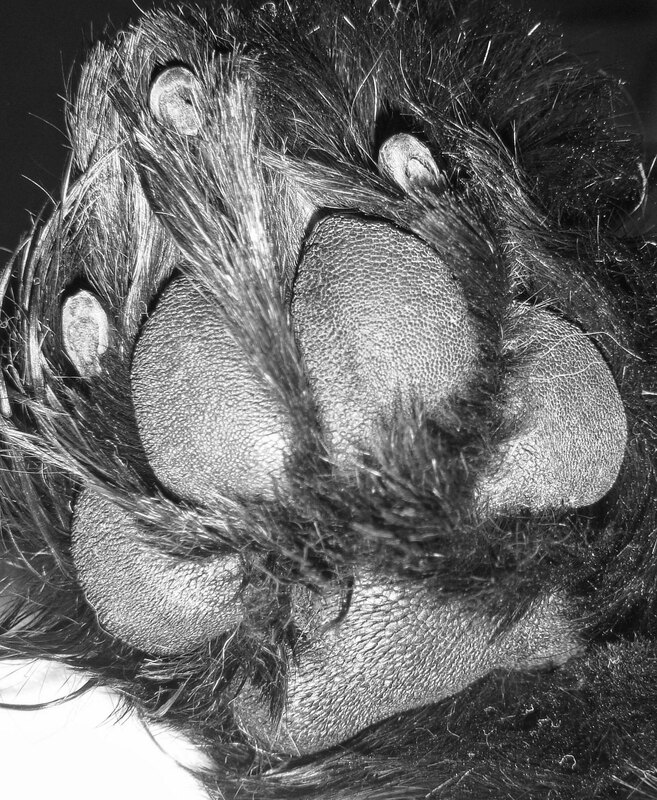 Read more about Mr. K's broken dew claw in Scottie Boo-Boo. I'm starting to believe there isn't a toy on earth Mr. K can't destroy. I've been fortunate to find a number of relatively durable ones but the most we get out of them are a few weeks. If we're really lucky, we might get a month or two out of them. Unfortunately for Mr. K, his ability to rip apart his all-time favorite toy - squeaky tennis balls - in less than 30 minutes has caused him to lose the privelege of possessing one 24/7. After all, destroying tennis balls can be an expensive habit when you go through them that quickly. Mr. K still has fun playing tug or toss with his other, slightly more durable toys but sooner than later, those toys meet their end as well. 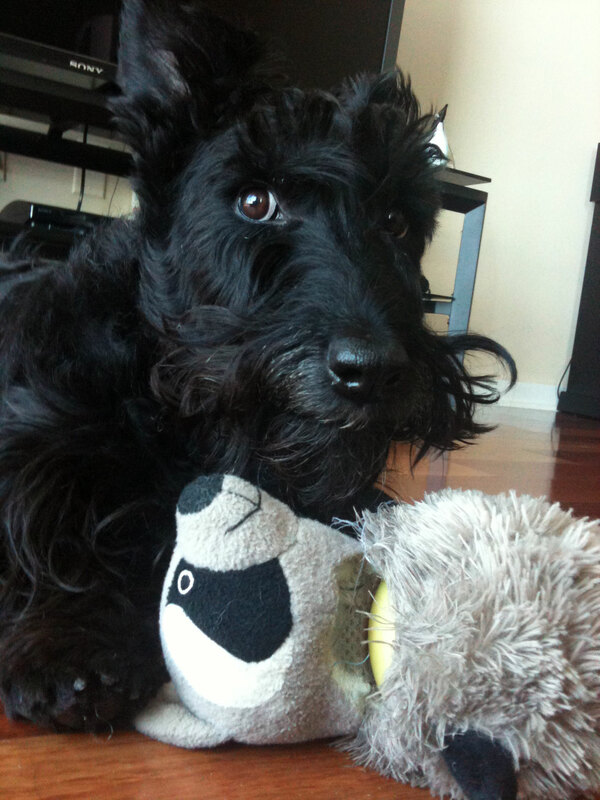 Curious to know, fellow Scottie Moms, how many toys do you go through in a month? 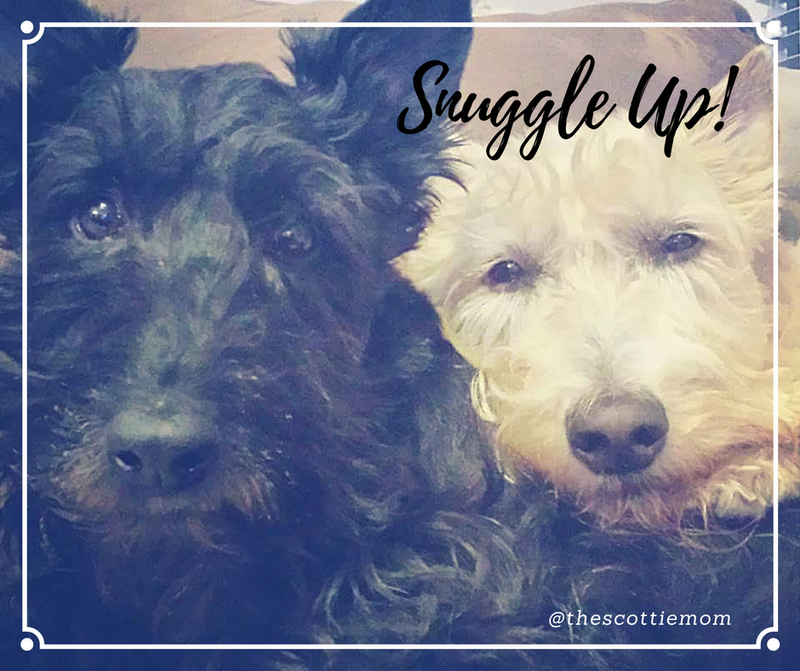 Have you had to budget a little extra money to keep the Scottie toy supply fresh? It's a busy day in this Scottie Mom's household. 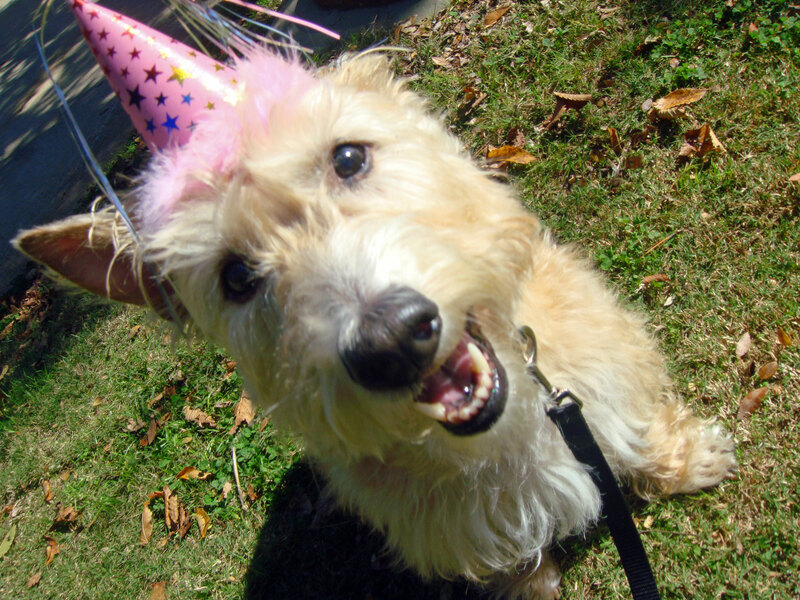 Not only are we celebrating Love your Pet Day but we're also sending birthday wishes to those who share this special holiday with our pets, especially Scottie Grandmadre and Scottie Dad's sister. Heather doesn't mind sharing the spotlight and offers up her best tail waggings and sloppy kisses to those celebrating a birthday today! Wish we were there to pawty with you! Need an excuse to spoil - I mean, pamper! - your pup? February 20 is Love your Pet Day. Though I think it is important we love our pets every day (not just on this day! ), what better reason could there be to shower the world with a little extra Scottie Love? 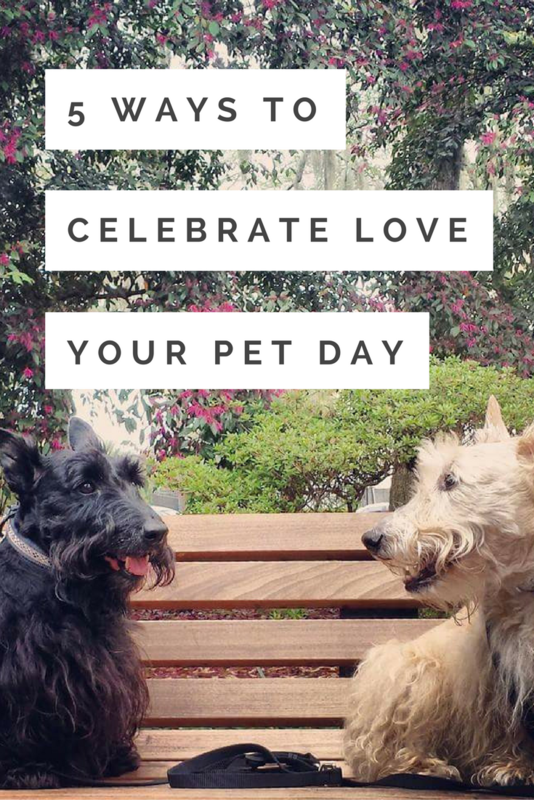 Here are five ways you can celebrate Love Your Pet Day with your Scottish Terriers and other furry friends. Share photos of your Love your Pet Day celebration on the Facebook page. You never know who might make a cameo on our blog! 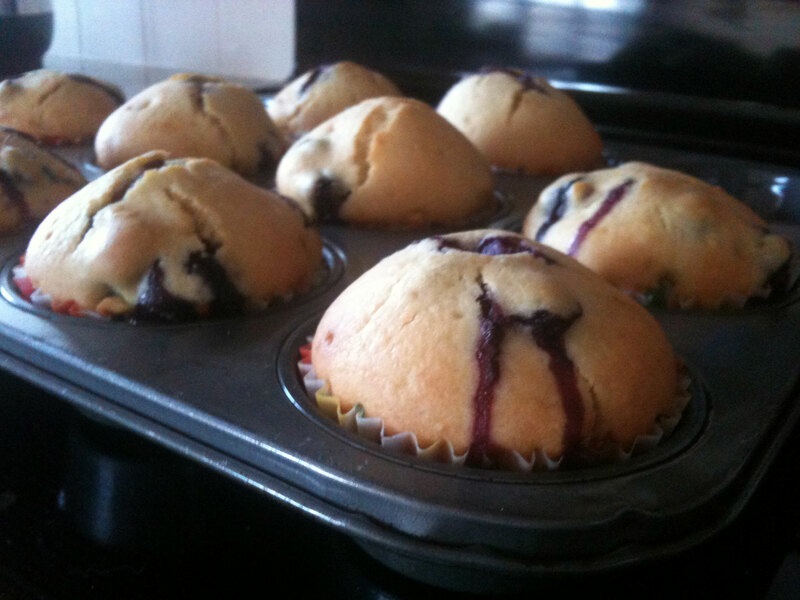 Bake some homemade goodness. Of course, you can't really go wrong with treats of any kind but take it up a level with some fresh-out-of-the-oven (and slightly cooled) treats. Your dogs will think it is Love your Pawrent Day! Looking for inspiration? Check out these 100+ dog treat recipes. Paint a pretty picture. Look for non-toxic, pet safe paints (try finger paints) and put newspaper on the floor. Then, roll out a bit of white paper. Have your pet dip their paws in the paint colors of your choice and let them leave their mark. Be sure to wipe your pets' paws immediately after they're done playing Picasso. Once dry, date the painting and frame it to be displayed for all to see. Bend the rules. Dog not allowed on the human bed? Cat not supposed to curl up under the couch protective cover? Bend the rules just this once and you'll be glad you did. It is an easy, cost-effective way to let your pet know you love them and will do pretty much anything to make them happy. Give a gift from the heart. Whether it is a new outfit, a fun toy or even a donation to a rescue in your pet's honor, gift giving often makes the human feel just as good as the pet receiving it. Commit to making your home pet-friendly. Whether it is creating a space all their own or adding some pet-friendly features to main living areas, your pet surely will appreciate this gesture. Need something to get those ideas flowing? Here are 40 images celebrating pet-friendly homes. 10. Scotties aim to please. Nothing makes Mr. K happier than to see me happy. Conversely, nothing saddens him more than when he thinks he has let his humans down. Go easy on the little one if he or she upsets you and keep your attitude in check. Scotties are sensitive creatures. 9. Your possessions become your Scottie's possessions. No further explanation needed. May I suggest, however, to pay special attention to the clothes in your laundry bin before they start disappearing. 8. Scottie-tude comes with the territory. 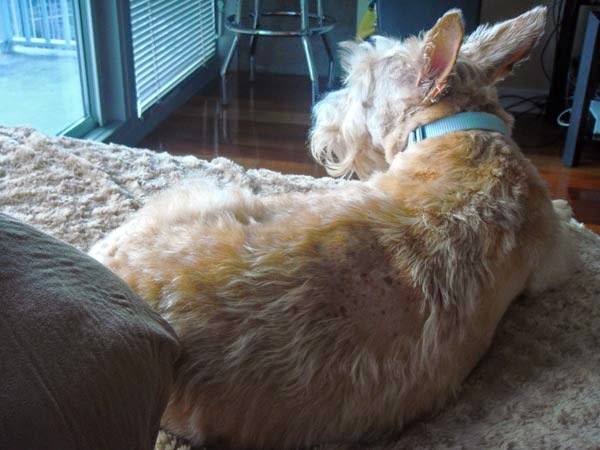 As much as your Scottie loves you, he or she may not love other dogs and especially not cats. 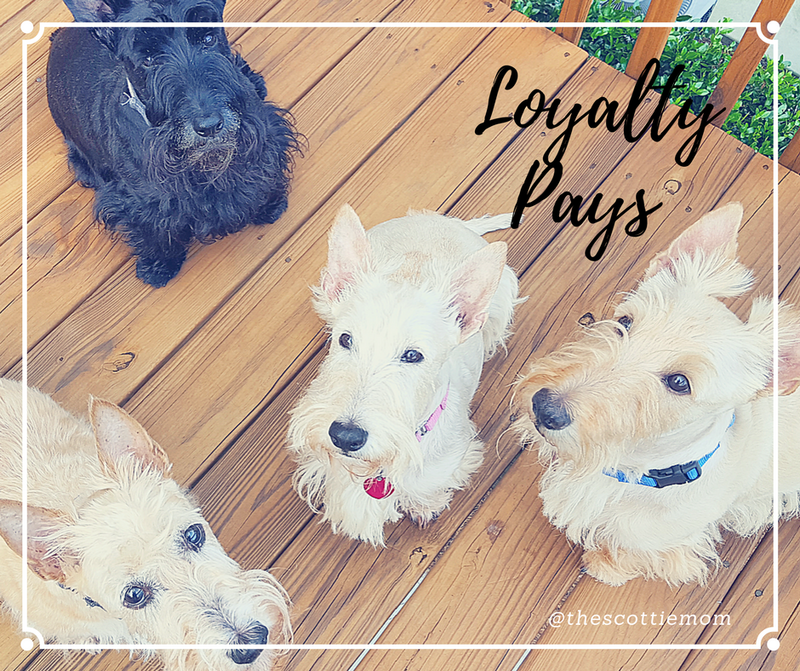 Socialize your pup as appropriate with other dogs...and as for the cats, few Scotties I've known have taken nicely to them so tread carefully. 7. There are no rules. Sure, you might say no dogs are allowed on the couch. You may even stack up the pillows on the couch to prevent them from climbing atop the sofa. Just don't be surprised when you come home to find paw prints on the pillows. 6. Anything within a Scottie's reach (and sometimes even those items that are not) is at risk. Leave a Scottie home alone without Scottie-proofing the house and you'll undoubtedly come home to a few surprises. Topping Mr. K's list are: an organic shampoo bar, a chewed up, nearly unrecognizable blue highlighter and a bag of cookies...and that was just one occasion. 5. Accidents happen. It's important to get your Scottie on a schedule to prevent accidents but sometimes, life happens and it gets thrown off. 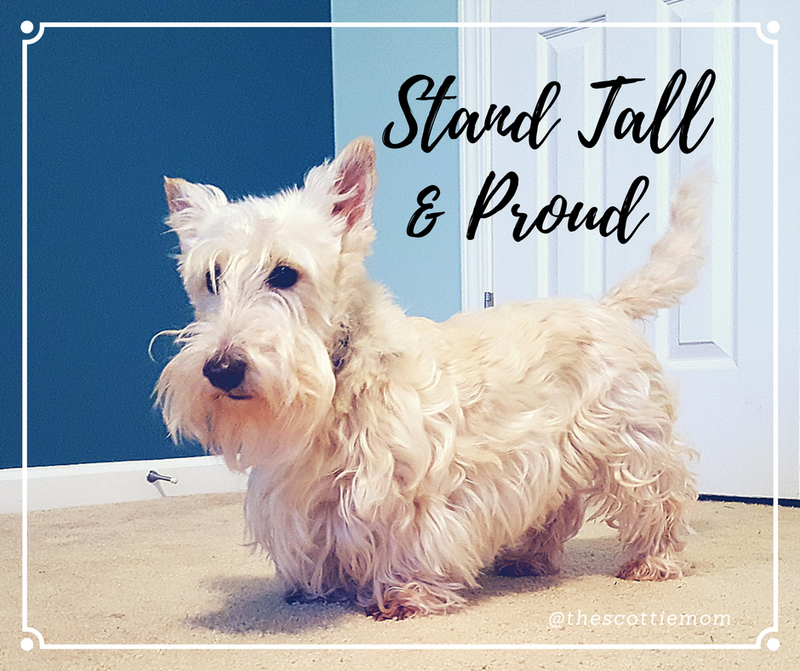 It may get frustrating, especially if your Scottie is like Mr. K and becomes acquainted with peeing in the house randomly and just minutes after you've walked him because he's "getting even" for being left alone. 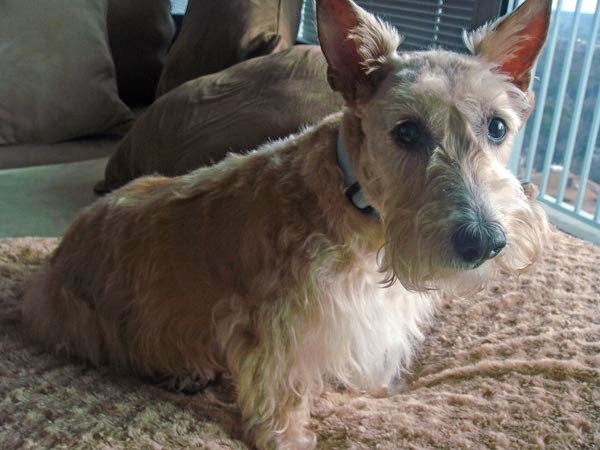 Lucky for this Scottie Mom, introducing Heather - the alpha (fe)male - was all that was needed to get rid of this nasty habit. 4. Scottie Security is legit. While your Scottie may not like everyone that walks through your front door, take special note of those that he or she does like. Scotties are incredible judges of character so if your Scottie doesn't approve of a date, perhaps it is time to reconsider. 3. Sometimes, Scotties stink. What did you expect? They're dogs! But, in addition to that fact that baths are a necessity in a Scottie's life, know that Scotties are notorious for clearing a room after passing gas. Beware the bottom! 2. Strength isn't measured by size. Scotties are a lot stronger than you might think. I've been told their jaws are the same size as that of a German Shepherd and I know they've got the fight of a big dog inside that tiny little body of theirs. My first weekend with Mr. K, he decided to challenge a Rottweiler. NO fun. 1. Expect the unexpected and enjoy every moment. Life with Scotties is never dull and there's no way to predict what tricks they have up their sleeves next. 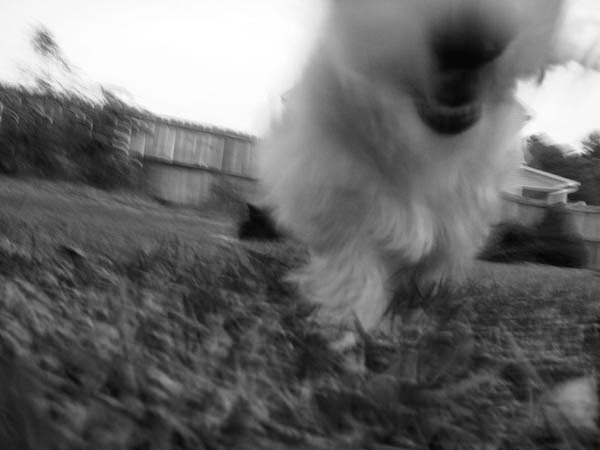 Whether it is spontaneously waking from a nap to zoomie around the house or stealing a shoe and shaking it until you chase after him or her, Scotties love to have a little fun and get a kick out of entertaining their humans. So sit back, relax and enjoy the Scottie show! Well, if there's one thing to be said about Miss Heather through all of this, it's that she never really lost her spirit. This last bump on the head had us all worried she might be sick of all her bad luck but with vigilant care and lots of affection, I was pleasantly surprised to see a big smile return to her face at last just yesterday. That's right: my little girl is on the mend and ready to move forward and move on! And, for the sake of this Scottie Mom's sanity, I sincerely hope our bad luck streak is over. Heather's come a long way from the raccoon trap she was discovered in just over two years ago and I want my baby girl to enjoy life to the max while she can. It amazes me how quickly our Scotties bounce back. It's only been a matter of weeks since Heather's surgery and the large incision is nearly covered with a new layer of hair. The area we removed one of the benign tumors still has some work to do and I occasionally wonder if we'll ever see hair on that spot in the middle of her back again but I can't help but be grateful. Hair or no hair, my baby girl fought to stay with us longer. You keep on with your healing powers and amazing us all, Heather! Your story, without a doubt, is one meant for the books. Today, the Scottie groomer came to our rescue! Heather and Mr. K were both in need of a bath and frankly, Mr. K was beginning to look a little overgrown. I feared we would have to cancel our appointment after Heather had her accident earlier in the week but our wonderful groomer assured me she could work around the injury area. Sure enough, Heather and Mr. K looked like rock stars when they came out and they've been walking around, strutting their cute Scottie stuff ever since! Our friends and families all know of my dedication to you, dear Scottie, and are aware of what my wishes are in terms of your caregiving should anything ever happen to me, and they will aid and assist you in transition however possible. 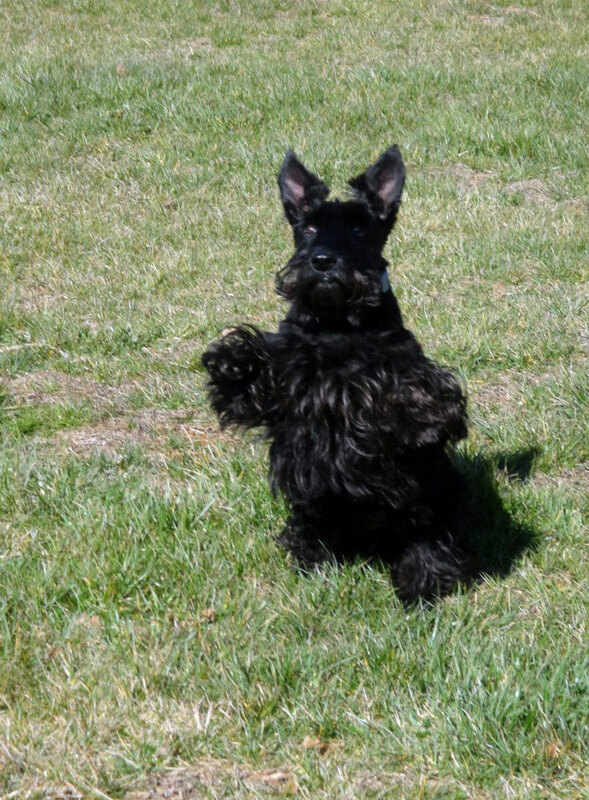 Raising a Scottish Terrier can teach you more about yourself than you think possible. 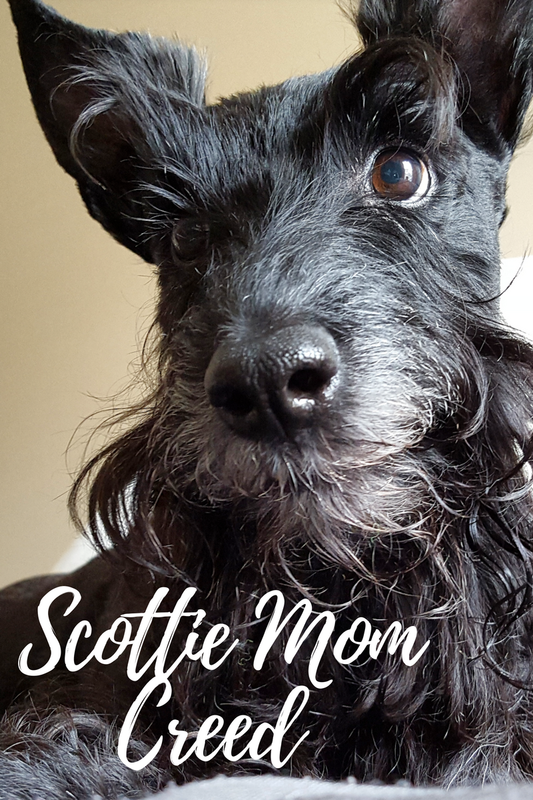 When I first became a Scottie Mom, I had no idea what the Scottie crew would have in store for me or how much they would teach me. 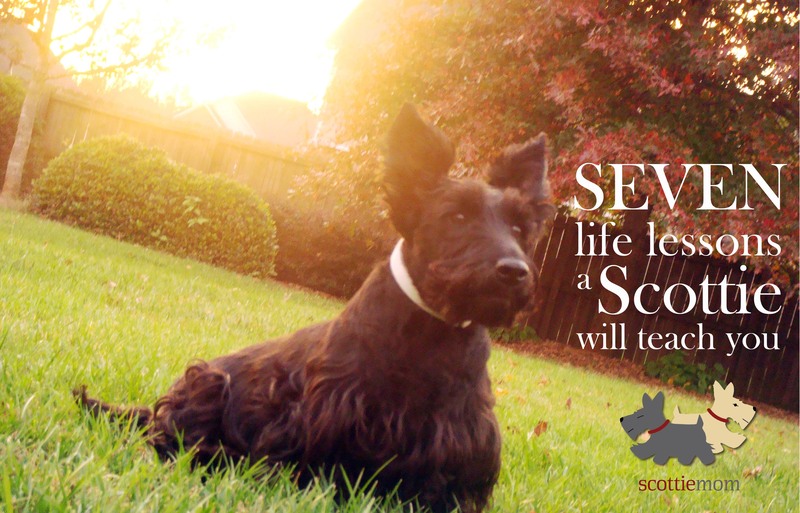 Years later, I consider myself all the wiser because of the life lessons my Scottie dogs have instilled. 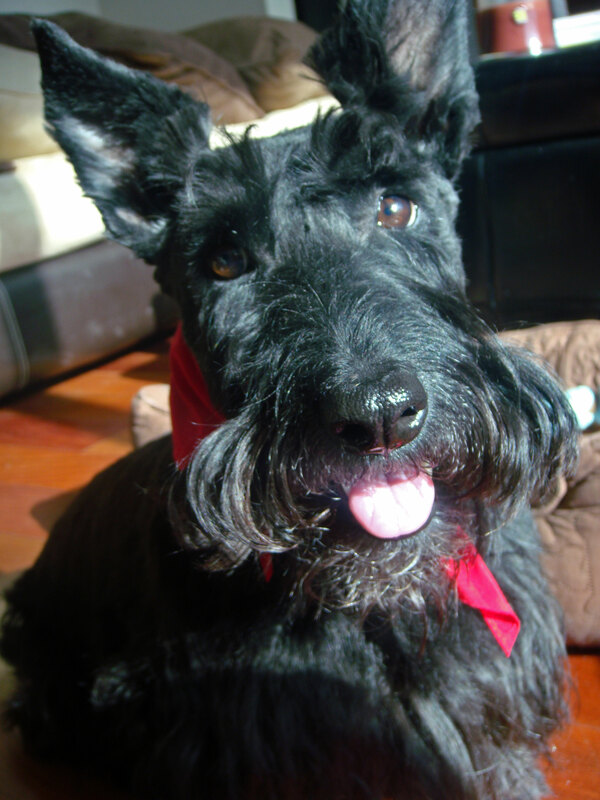 Below are just a few of the life lessons a Scottish Terrier will teach you. 7. Take life seriously...but not too seriously. We all have a purpose in life and sometimes, life requires us to buckle down and get down to business to discover that purpose. Work hard to achieve your goals but don't forget to destroy some toys and eat treats along the way. 6. Stand tall and proud. Confidence goes a long way in shaping the way others perceive you. Confidence commands respect and causes others to stop and see what you're doing different. Just be sure not to confuse confidence with arrogance and stay humble at the core. 5. Savor the good stuff. And don't let it go to waste! Be thankful for every meal. 4. 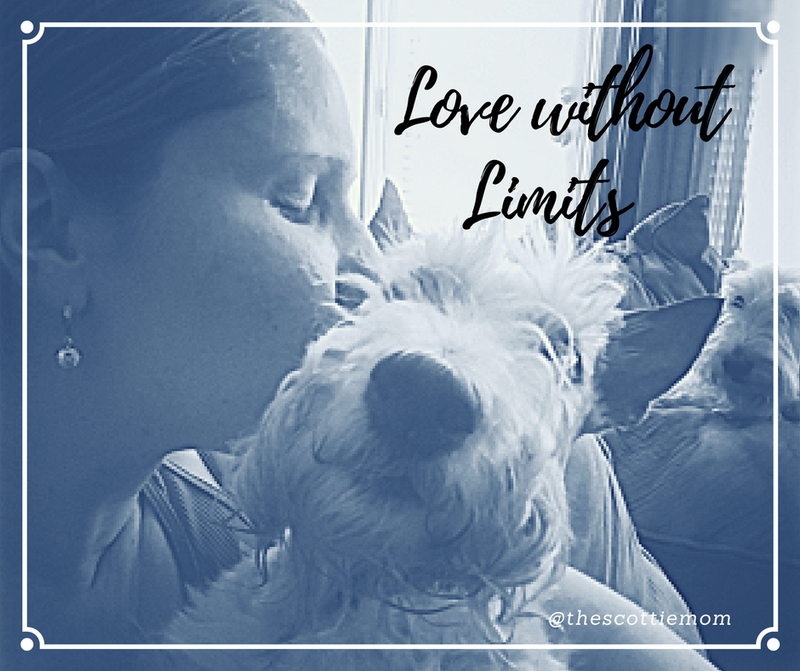 Love without limits. A Scottie's love knows no bounds. You can even feel it long after they've gone. Vow to cherish those closest to you and shower them with your love...you'll never know a lonely heart. 3. Loyalty pays. Let's face it: it pays to have good friends. Choose your pack carefully and once you've established it, look out for them and have their back through thick and thin, just like you'd expect them to look after you. 2. Stay sharp. You never know when the next opportunity to chase and realize your dream (of catching a squirrel) will come around. Therefore, you must stay alert and hone your skills. 1. Snuggle up. Know when to call it a day. Nothing beats curling up with a big, fluffy blanket at the end of the day and getting a good night's sleep to recharge your batteries. Go ahead, stretch out and relax. Tomorrow's another day. 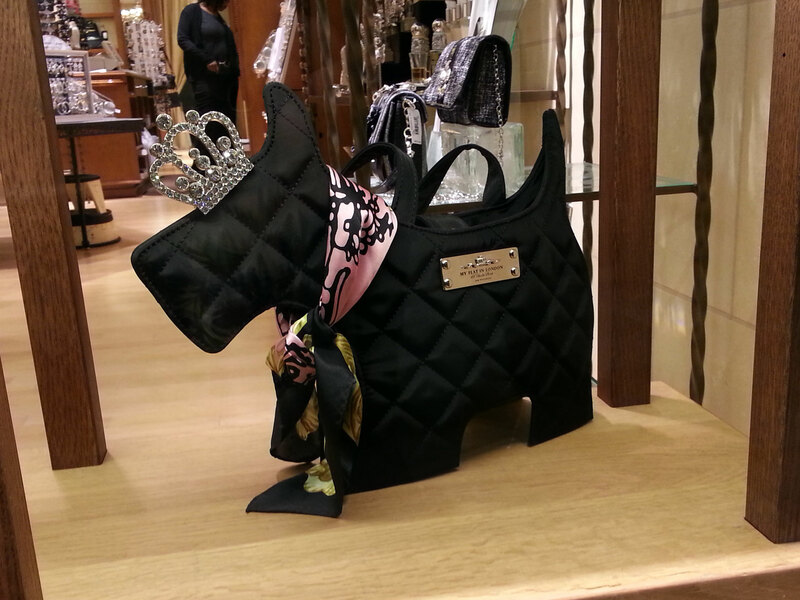 Brighton Collectibles really knows how to catch a Scottie Mom's eye! 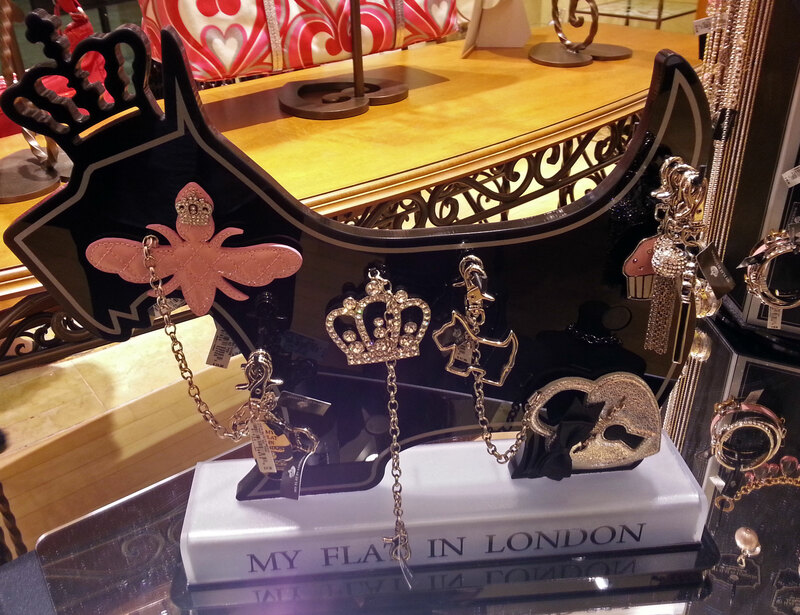 I just had to stop in and check out the darling My Flat in London Scottie purse in the window. For the first time, I was briefly tempted to break my rule of never wearing Scottie-printed clothing, accessories, etc. in public. Now, don't get me wrong - kids wearing Scottie clothes is perhaps the most precious thing next to Scotties themselves but I haven't seen much out there for us adults that I'd want to wear in public. And, as much as I adore Scotties, I simply can't see myself taking my Scottie love to the next level by wearing them on my clothes (pajamas excepted, of course!). The only other exception I could see myself allowing for is if that particular Scottie-adorned item also happened to be an exact match to my style...and there really isn't much Scottie clothing out there that fits that category! This purse and some of the other accessories, however, came close and were actually pretty darn cute so I figured I'd share my finds in case there are Scottie Moms out there braver than I to proudly showcase her love for Scots by working it into her wardrobe! It's official: I believe there may be someone else in Heather and Mr. K's life. Someone who they might actually enjoy seeing more than their Scottie Mom. (Gasp!) It started a year ago when we met a member of the housekeeping staff near the elevators on the way out for a morning walk. She doted on Heather and Mr. K, asking what kind of dogs they were and commenting how friendly Heather was and how antisocial Mr. K was (so not true!). Mr. K soon worked his way into her heart by sneaking up behind her and launching a verbal attack on the evil vacuum she dared to use in his presence one day. Soon thereafter, every time Heather and Mr. K would get off the elevators in the morning and come back from their morning walk, there she was greeting them with the friendliest of faces. She nicknamed them Angelina Jolie and Brad Pitt (obviously for their good looks!). And, just before they would duck away into the elevators to go upstairs for their morning meal, she would call them over and offer them the most sought after of gifts: TREATS! It became apparent Heather and Mr. K were so happy to make this acquaintance that they would actively search around corners in attempts to find their newfound friend each morning when she wasn't immediately in sight. And how disappointed they would be when they didn't find her some mornings! Oh, but when they did find their new friend, Heather and Mr. K would work their magic. Mr. K would approach quietly and then sit and wait. Heather would take her sweet loving into overdrive and shower her new friend with affectionate smiles, tail wags and opportunities for back scratchings. 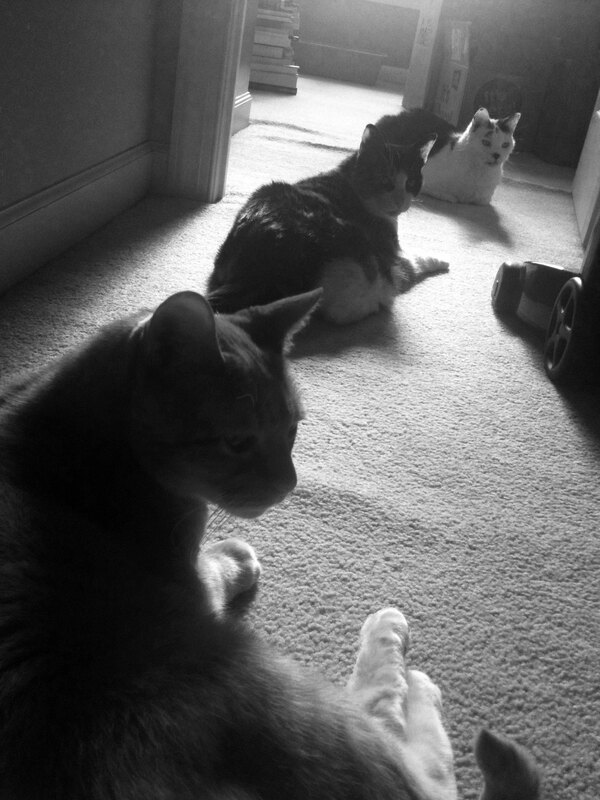 Not more than a minute or two would pass before their friend would produce two treats in hand: one for Heather, one for Mr. K. And, as if that wasn't enough, they start the whole process over hoping for a second round of treats (which they sometimes get). With their eyes constantly on the prized treats and the new friend that holds them, they often prefer to pretend they don't hear Scottie Mom calling them to the elevator. In fact, most mornings their new friend is around, they insist on staying with her and will not budge unless their new friend coaxes them back on the elevator with Scottie Mom. Go figure. Alas, it appears this Scottie Mom has fallen from the top spot and has been replaced (temporarily, I hope!) by the treat lady, who has become something like the "cool aunt." Guess it's time to break out that treat making kit and cookbook and see who the 'top dog' will be then! Life with Scotties never slows. 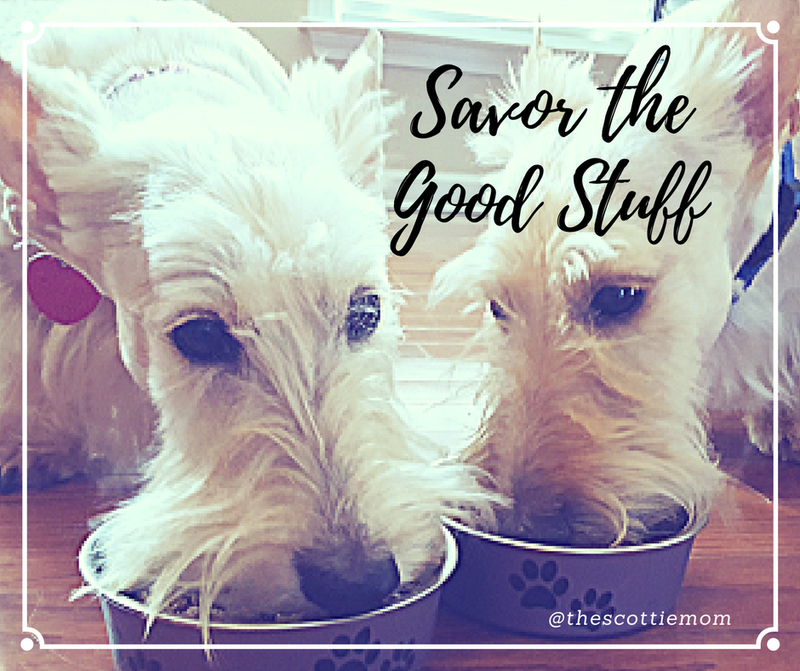 Whether it's a trip to the park or another visit to the vet, the Scottie Mom is always on the move. It's hard to believe that just 11 short months ago, our Scottie health troubles started...first with Mr. K and then with Heather. It seems like just yesterday it all began. If there's one thing to be said about Scotties, though, it is that they are very resilient creatures. It took Mr. K less than two weeks to completely eradicate whatever strange illness overcame him last March and he hasn't looked back since. Heather seems to be very much of the same path, having played host for a malignant form of localized cancer called liposarcoma one minute and getting rid of it all together the next. Today, they are both my little fur balls of energy, exploding with happiness from their wagging tails to their smiling faces. I don't pretend to understand any of it for a minute. 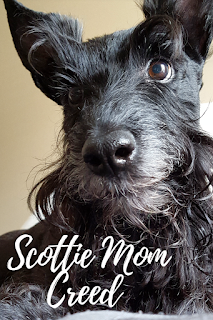 Sure, I suppose I am all the wiser of a Scottie Mom for having stood by my little ones throughout their ordeals but really, I owe their lives to advanced veterinary medicine and a very Scottie-like strong will power to live. And while I'm still grasping at straws to comprehend everything we have all been through, Heather and Mr. K have seemingly put their trials and tribulations behind them already as if they are prepared to move forward, take on the world and see what silly adventure they stumble upon next for their favorite Scottie Mom readers. Now that is a lesson we all could learn: to take life as it comes, enjoy it for what it is, fight only the necessary battles and restore it to its previously harmonious and happy state as quickly as possible. You know, I may be the Scottie Mom here but it seems like these fur kids aren't done teaching me new things about life just yet. 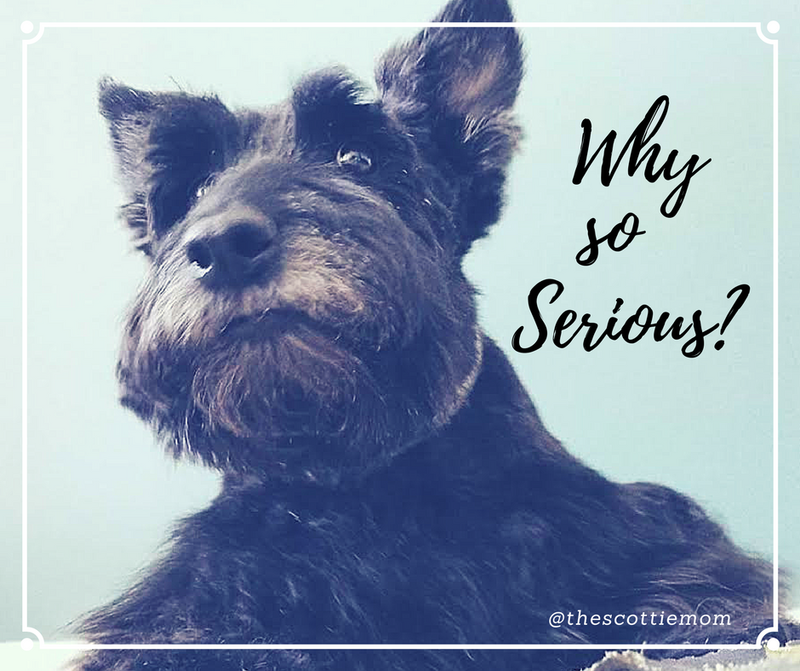 Needless to say, there's never really a dull moment in the life of a Scottie Mom. 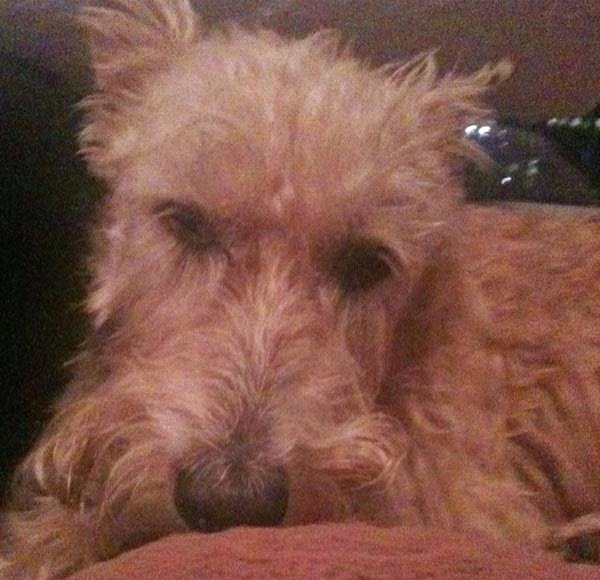 Heather's vet recently revealed she'd like us to consider testing Heather for Cushing's disease. Normally, I'd be panicking about what those results would be long before we even agree to take the test. Then, there's the ALP liver value that still hangs around 500 and the worry of whether the big C will come back and haunt my baby girl. This time, however, I've decided to take the Scottie high road and follow my fur kids' examples. I'll let life take the leash and hope that it affords me many more happy years with my babies. Who knows? 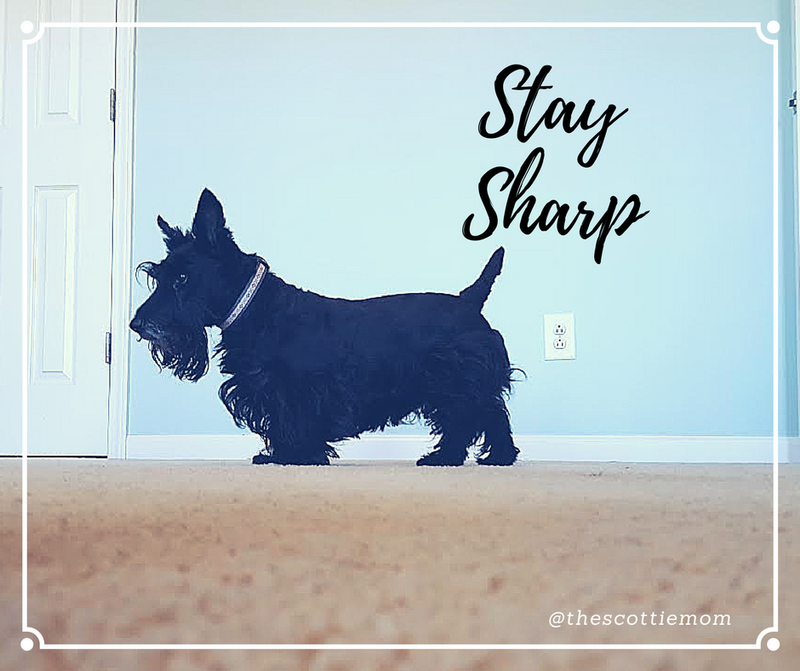 Maybe by applying this Scottie method to dealing with the cards life deals you, we'll soak up more of the good times and be speeding on by the bad, faster than the speed of Scotties! Tomorrow, we return to the V-E-T. And, as much as Miss Heather dislikes going, we can't really call them evil anymore since they did us such a favor by removing the one true evil that endangered my baby's life: the big C. Heather has bounced back from surgery and she is as full of energy as ever. People still gawk at her when they see her but that doesn't stop her from showing them some serious Scottie love! Some ask me if she got beaten up. To me, she is just as beautiful for it is her strength, courage and love of life that makes her glow the way she does. Her wounds are healing nicely and she's back to eating dry food (much to her dismay, I can assure you!). The staples and stitches will come out tomorrow and we'll get to have a more in-depth conversation with the V-E-T about Heather's overall health. I'm hoping for a good report. This Scottie Mom has had enough bad news for one year. 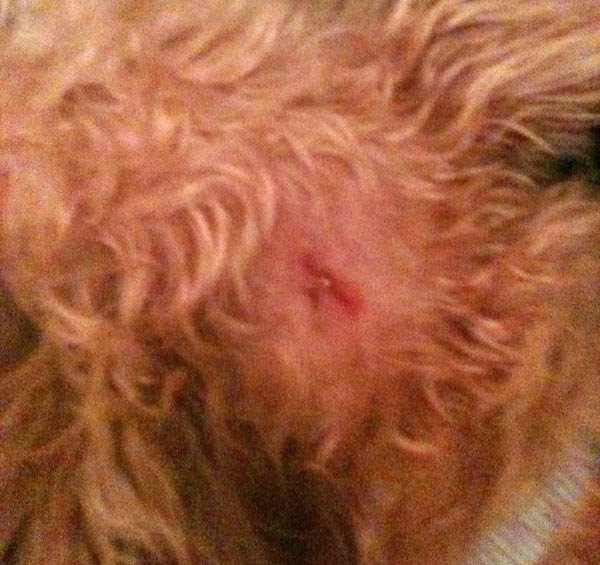 Wish my little lady luck tomorrow and hope the staples removal is 100 percent ouchless! We'll let you know how it goes.